Along with being a great tasting culinary oil, pumpkin oil is most commonly taken for preventing hair loss and prostate problems, due to its reported DHT blocking properties. 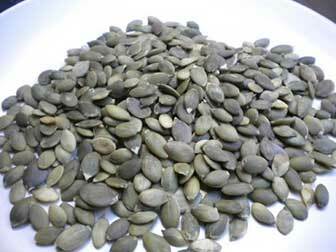 This page has 5 more important pumpkin seed health benefits and how taking it regularly can help improve your skin, treat joint problems, maintain health vision, alleviate bladder problems and much more. Like the seeds, raw pumpkin seed oil can help improve skin tone and may be a beneficial supplement for many skin problems like acne, dry flaky skin, eczema and psoriasis. Alongside the powerful antioxidant content, the high levels of natural fats would appear to be responsible for this effect. The fatty acids in this healthy oil assist in maintaining smooth skin tone and will help speed up the repair of dry, flaky and irritated skin. They are also important for proper moisture levels within the epidermis and normalizing skin’s oil production. Vitamin E, especially the gamma-tocopherol version found in good concentrations in pumpkin seed oil, and carotenoids like beta-carotene, are powerful antioxidants for protecting your skin from damage and reducing the signs of aging. It is actually so good for the skin, some practitioners even recommend applying it directly to your face as a treatment. While people have reported positive results with this, taking the oil regularly would seem more important for skin health than going for the green face look. Your skin is one of the most obvious reflections on our health and nutritional intake and a good pumpkin seed oil like this can help play a part in improving that reflection. Pumpkin seed oil is often included in products designed to alleviate bladder problems and urinary incontinence. In older men, this issue is often related to an enlarged prostate and it’s DHT blocking properties may help reduce the problem. But in older women, bladder problems are usually caused by a weakening of the bladder sphincter and pelvic floor. Taking the oil daily can help, but recent studies have shown even better results with this new water-soluble pumpkin seed extract. The high fatty acid content in pumpkin seed oil helps lubricates joints and can be beneficial for diseases of inflammation like arthritis. In fact, studies have shown regular doses to be even more effective than the anti-inflammatory drug indomethacin for reducing arthritic pain. However, unlike indomethacin, it did not elevate liver lipid peroxide levels (something that may actually lead to a worsening of arthritis symptoms). Consult a knowledgeable healthcare professional if you suffer from arthritis, but also know that not all effective treatments come in a patented prescription pack and regular pumpkin seed oil may be a better and cheaper option. Alongside its beneficial fatty acids and other antioxidants, cold pressed pumpkin seed oil usually contains high levels zeaxanthin. Zeaxanthin is an antioxidant carotenoid that has been shown to protect your eye’s retina from both UV and blue light damage. Because of this, it may help reduce the risk of macular degeneration, a very common problem for older people, and improve visual acuity in general. Pumpkin seed oil contains good levels of phytosterols that can block the absorption of cholesterol in our gastrointestinal tract. For this reason, along with its beneficial fatty acids and antioxidants, it has been used concurrently with cholesterol-lowering drugs to both help lower overall LDL cholesterol and reduce the side effects of cholesterol medication. Of course, consult your doctor if you are currently taking medication, but for anyone wanting to lower their cholesterol levels a little, taking a teaspoon of the oil regularly may have potential. Pumpkin seed oil has also being used as a treatment for irritable bowel syndrome, for dealing with intestinal parasites like tapeworms, to lessen the symptoms of osteoporosis and to prevent and even treat kidney stone problems. These are just a few of the more commonly reported health benefits. If you would like to try it for yourself, the next page is on where to find good pumpkin seed oil at a low price. 1000 mg soft gels for incontinence? I used pumpkin oil from Puritan pride, really didn’t notice a difference so I talked to my Dr. She said to lay off of the coffee and iced tea. Made all the difference in the world.